Patron Jim Warne presents Don Cox’ bronze sculpture of George Warren to Gov. Jan Brewer on statehood day (Feb. 14) 2013. It’s hard to believe it’s been 137 years since Bisbee’s “discovery.” Originally known as Mule Gulch, after the main east-west canyon, the area was frequented by Apaches and the soldiers chasing them, but it wasn’t till the summer of ’77 that someone found something worthwhile. Those folks grubstaked George Warren to come back and file more claims, which he did, though not to the benefit of the original discoverers. This is the sculpture at the Cochise County Board of Supervisors’ office, if you want to stop by and take a look. George had a long and colorful history in Mule Gulch and (after 1880) Bisbee until his death in 1893. A drunk he was throughout this time, but a great story-teller and a legend in his own time. The most colorful George Warren tale took place in Charleston, near Tombstone, where he bet he could outrun a horse. He bet his interest in the Copper Queen mining claim — and lost. Had he won, he would have gotten a pretty fine horse. George did much better after he died — sounds like an artist — it seems. His iconic photo, taken by the locally famous C.S. 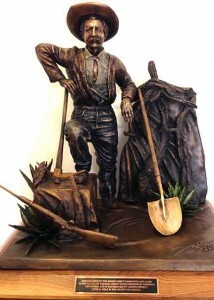 Fly, became the model for the miner on the Arizona State Seal, and a monument of some stature was erected at Evergreen Cemetery. The mining district at Bisbee was named for him, as was the community planned and built nearby after the turn of the century. 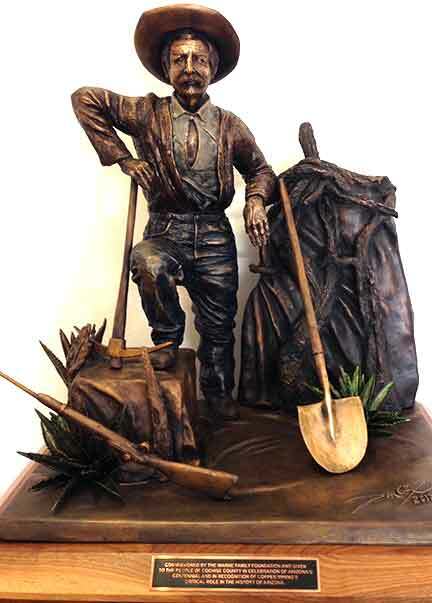 And more recently, Bisbee-born sculptor Don Cox was commissioned by another Bisbee native, Jim Warne, to create a newer monument to the man. 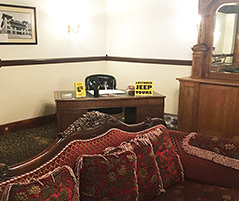 Two copies exist, one at the Arizona capitol (which also has George, in the State Seal, permanently inlaid into the floor) and one at the Cochise County offices in the San Jose area. Lavender Jeep Tours takes its visits to Evergreen Cemetery on both the Greater Bisbee and Mining Landscape tours. Visitors also get to see the suburb of Warren, which — in all truth — would have been anathema to ole George. It would have been too boring, since there were never any bars in the town. With all of his faults, perhaps because of them, Warren was representative of Bisbee so many years ago, when so many lived the rugged life, always searching for their fortunes, but living in a way that was almost guaranteed to keep them impoverished. Yet they built an enduring copper camp, and a state, through their struggles. That is why George has become a legend. I grew up with Don Cox and have appreciated his talent for decades, I only wish I could afford one of his works. I remember seeing the “miners pushing the ore cart” for the first time and was really taken back by the detail and the emotion of the piece. You can see the miners straining to push that cart, and the detail down to the hair on their arms. That was in 1985. We may have had a better sculptor come out of Bisbee but if so I would like to see his work because it don’t get better than what Don can do. I remember playing with plastic army men when we were 8 or 9 years old and Don had to have real battle casualties so he flamed his enemy. I remember watching him use fire crackers and lighter fuel to destroy an original G.I. Joe in his jeep with a flame bomb. Those toys are worth a hundred bucks nowadays, but Don would build the entire battlefield and then burn it down. It had to be real and that shows in his sculptors. So much detail. Glad to know his work will be around for the public to enjoy for many years. Previous Previous post: What are all the yellow sandbags around Bisbee for?